If you ever wondered what it would be like to take a class on memoir writing or a class with Mary Karr, this book is for you. It’s based upon a class syllabus. I’ll admit I’ve yet to read LIT for some reason though I own a copy. I did immensely enjoy Cherry and The Liar’s Club. I also went to hear Karr speak and she’s wonderful. I imagine her being a thorough and thoughtful teacher. She explains what makes each memoir special, what makes each stand-out and what makes each writer successful in writing memoir. It’s not a how-to-write book. Karr makes that quite clear. She writes: “No one elected me the boss of memoir. I speak for no one but myself. Every writer worth her salt is sui generic.” It’s a survey course in memoir writing. Here’s how Karr beautifully describes the heart of memoir, one’s memory: “Memory is a pinball in a machine—it messily ricochets around between image, idea, fragments of sense, stories you’ve heard. Then the machine goes tilt and snaps off. But most of the time, we keep memories packed away. I sometimes liken that moment of sudden unpacking to circus clowns pouring out of a miniature car trunk—how did so much fit into such a small space?” Karr includes an important chapter on why NOT to write a memoir—revenge, writing about those you vehemently despise and writing that will negatively affect a group of people. In explaining the importance of voice, Karr states: “Voice isn’t just a manner of talking. It’s an operative mindset and way of perceiving that naturally stems from feeling oneself alive inside the past. That’s why self-awareness is so key. The writer who’s lived a fairly unexamined life– someone who has a hard time reconsidering a conflict from another point of view– may not excel at fashioning a voice because her defensiveness stands between her and what she has to say.” The point is: “Great memoirs sound like distinct persons and also cover a broad range of feelings,” Karr writes. Anyone who enjoys reading memoir can generally distinguish the good from the bad and it’s often based on voice. If you can get into a memoir whether it’s about drug dealing or being in prison or a hiking trip or mental illness or adopting a cat, there’s usually a distinguishing voice and emotions throughout, you’re going to keep reading. If it’s flat you’re likely to put it aside. Karr stresses: “The best voices include a writer’s insides. Watching her mind feel around to concoct or figure out events, you never lose sight of the ego’s shape, its blind spots, dislikes, wants.” Some of the elements Karr writes about include choosing details to include, knowing how to edit, lying/ stretching the truth, finding your talent, dealing with loved ones both on and off the page and structure. This book includes tips for writers at every level. It’s much more academic than I expected. Although knowing it’s based on her Syracuse University class syllabus makes sense. However I’m ill-prepared because I have yet to read many works discussed. 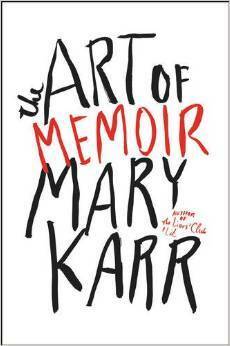 You might want to check the recommended reading list, read a few memoirs then read Karr’s The Art of the Memoir. FTC Disclosure: I received this book for review from Harper Collins. This entry was posted on November 6, 2015, 19:55 and is filed under Books. You can follow any responses to this entry through RSS 2.0. Both comments and pings are currently closed.